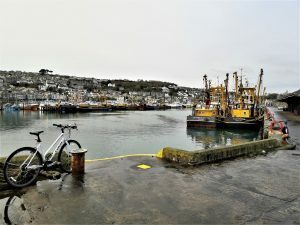 When I go cycling along the Mounts Bay Route I often like to try to include somewhere to stop off and have a drink and occasionally lunch. My routes are often dictated by where I feel like eating that day. Shall I go for Ben’s specialty fish soup at The Tolcarne Inn at Newlyn. If it’s Tuesday then its got to be fish ‘n chips at The Mexico Inn. 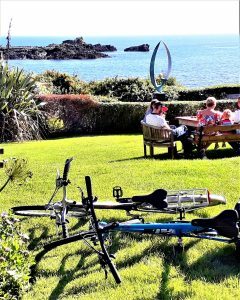 Or shall I cycle over to Mousehole and indulge myself at The Old Coastguard. There are so many excellent places to eat and drink around the Penwith peninsula. 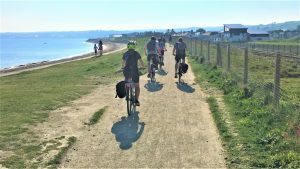 This is about a few of my favourite stop offs along the Mounts Bay Route. This has become our local haunt as it is the closest to our base in Long Rock. IT’S NOT A MEXICAN RESTAURANT!!! Many people have mistaken it for a Mexican due to its name. The inn has been part of the history of Long Rock for over 200 year. The Mexico Inn got its name due to its link with Bill Trewartha, a mining engineer. 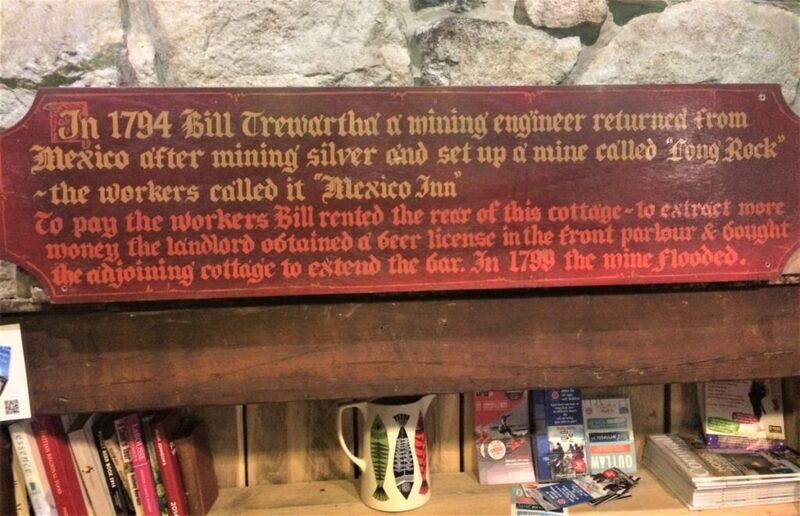 After returning from Mexico Bill set up a mine called ‘Long Rock’ – however the workers called it ‘The Mexico Inn’. There is a plaque on the wall of the pub which explains the origins of the pub. Amy and Tom took over in 2015 and renovated it making it feel really cosy and comfortable. It has a shabby-chic feel, with leather settees surrounding its wood-burner in the bar and a sunnier room to the rear. My favourite is the lovely suntrap yard hidden away at the back. 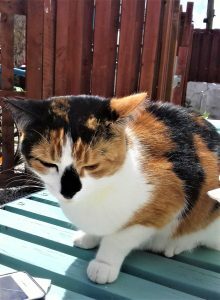 Look out for Elfie the pub cat will come and greet you. During the week they have theme days. For example: there is Bubble Monday (Bubble n’ Squeak £8.50), Chippy Tuesday (Fish ‘n Chips £8.50) and my favourite Wobbly Wednesday when you get 20% off selected drinks. Ben Tunicliffe and his wife Kinga run this old historic pub. Its unique, dating back to the 1717. Again its cosy inside with the addition of a wood burner in the winter and live jazz on a Sunday. Ben has gained Michelin Stars whilst at The Abbey (Penzance), and gained a Michelin Bib Gourmand for his food at The Tolcarne. The menu is short and put up on a board daily depending on the catch. Consequently you can see any one from a plethora of seafood on his board, such as brill or bream, cod or crab, mackerel, mullet or mussels, and the famous john dory; according to seasonal abundance. All the seafood is from Newlyn which is Britain’s largest fishing port. Furthermore Ben makes a delicious fish soup accompanied with his basket of bread, is enough for lunch if you don’t want the whole meal thing. The Old Coastguard is on the edge of the fishing village of Mousehole as you cycle up from the ride up the small hill. 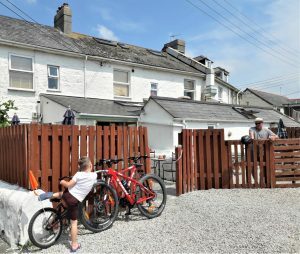 It is one of 3 pubs owned by the Charlie & Edmund Inkin; The Gurnards Head, Treen and The Felin Fach Griffin, Wales being the other two. It has a spacious, attractive bar and restaurant, with a sitting area that looks out over the its sub-tropical filled garden, the sculptures dotted around and out towards the sea with St. Clement’s Isle. The food is locally sourced and seasonal. They are keen to be part of the local community and put on events and exhibit local artists work. If after your cycle ride you want to just chill for a few hours and take in the atmosphere of a the area, then this is the place to go. In the summer on a sunny day, you can sit in the back garden with a cold beer or glass of wine and just look out to sea. 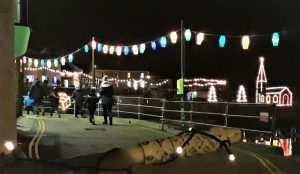 Or in the winter pop in before visiting the Mousehole lights. 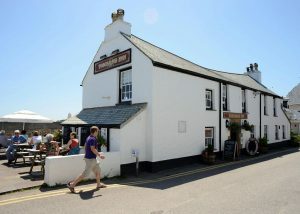 The Mounts Bay route takes in all 3 of these pubs. For more on this route go to our ROUTES page or CLICK HERE for detailed information.